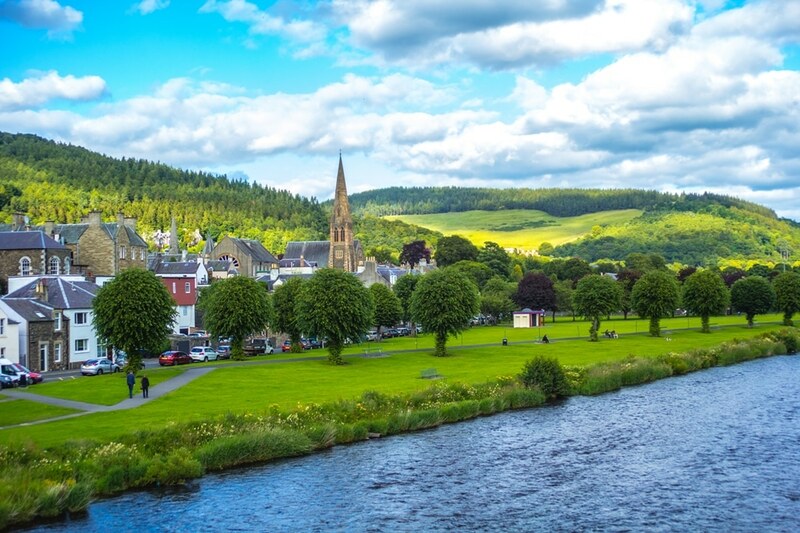 The Riverbank Town of Peebles, Scotland – Dotting the banks of the River Tweed are glorious little towns with histories all their own. One such town is Peebles. Located not too far from Scotland’s capital city of Edinburgh, Peebles is bursting with extraordinary activities, shops, eateries, and events that provide entertainment regardless of the time of year. In fact, the town is so inspiring that many people in the arts choose to take up residence permanently, such as one of Scotland’s most famous novelists, John Buchan. Peebles is very much a walking town. Much of its history is set up as a walking journey, and quite literally there is no way to put the wrong foot forward! Buchan is a legend in these parts, and one of the quaint streets, John Buchan Way, illustrates how life was during this legend’s lifetime. At the John Buchan Center, you can learn more about this man and his life, and why the countryside of Scotland was so inspiring to him. Another walking trail, Thirty-Nine Steps, illustrates Buchan’s most favorite places in the city, many of which he wrote about in his books. For a really inviting walk, trek your way to Glentress Forest through Peebles’ streets, and complete the circuit walking back along the River Tweed. You might find Buchan’s life so inspiring, you may be inspired yourself! In fact, there are several places to allow your creativity to flow, with arts and writing classes at the local galleries. You’ll see works of local artisans and be inspired to make something of your own to display when you get back home. The Tweeddale Museum has an ever-changing lineup of exhibitions, so stop by to see what is going on while you’re there. In addition to Buchan’s history, you’ll find many other tales from this city’s history, told in the architecture of the buildings, some of which date back to the 1000s. There are ancient relics from this and other periods of history here, such as a Mercat Cross and even the ruins of Cross Kirk. The arts are not all that you will find inspiring in Peebles. In fact, leisure time in Peebles can be filled with fishing, hiking, mountain biking, and all-around adrenaline rushing. Peebles is located in the midst of Scotland’s 7stanes. These are seven centers for mountain biking that span the entire southern portion of Scotland. At the centers, you’ll see they have bikes to borrow and even programs to teach you if you’ve never mountain biked before.